This map was shortly following the Mexican American War (1846-1848) and the Treaty of Guadalupe Hidalgo. 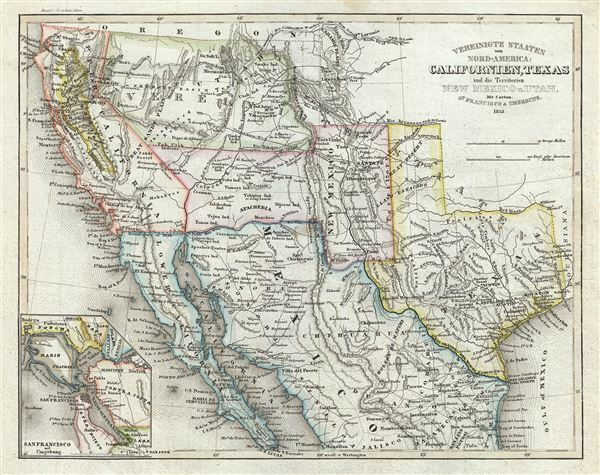 The 1848 treaty, which formally ended the war, annexed all Mexican territory north of the Gila and Rio Grande Rivers, including the short lived Republic of Texas, to the United States, increasing the country's size by about 35%. Texas is here shown in a most unusual incarnation, extending north as far as the Arkansas River but terminating on the west at the 26th degree of Longitude. This map was issued as part of Meyer's Groschen Atlas. It was most likely drawn by Jospeh Grassl , as were previous variants of this map presented in earlier editions of the Groschen Atlas, but the Grassl imprint has here been removed, suggesting that the plates were updated and revised by another unknown mapmaker. There are several variants on this map, mostly relating to the political evolution of the Texas-New Mexico region. Despite all examples being dated 1852, we have identified at least three variants. This being the second. Wheat identifies this map as '1852 German,' citing its obscure origins; however we have identified the cartographer as Meyer/Grassl.